Every Monday, I try to share with you a review on a Pinterest find that I’ve tried. Most of the reviews are ones that I have loved and can’t wait for you to try. Today, not so much. 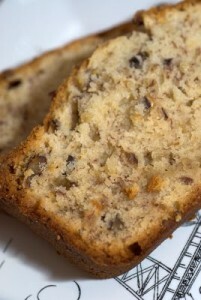 I found this recipe for Cream Cheese Banana Nut Bread that sounded like a slam dunk. Banana Bread + Cream Cheese, what could be better? Well, I’ve made it twice now trying to give it a real shot. But, I just didn’t think it was that good. Why share the recipe with you then? I don’t know. Maybe you’ll try it and love it and tell me I’m an idiot. Just giving you the Bobi Ann review. Though this recipe came from Southern Living Magazine, it is not a recipe I’ll be making again. Combine flour and next 3 ingredients; gradually add to butter mixture, beating at low speed just until blended. Stir in bananas, pecans, and vanillla. Spoon batter into 2 greased and floured 8×4 inch loafpans. Bake at 350 degrees for 1 hour or until a long wooden pick inserted in center comes out clean and sides pull away from pan, shielding with aluminum foil last 15 minutes to prevent browning, if necessary. (I found that after one hour, my banana bread wasn’t completely cooked through. I ended up baking it for an extra 10-15 minutes.) Cool bread in pans on wire racks for 10 minutes. Remove from pans, and cool 30 minutes on wire racks before slicing. Question: Do you have a banana nut recipe that you’ve tried and loved? Have you tried this one? Am I right or way off?